"WITH EVERYTHING GOING ON IN OUR STREETS and in the world, we need a Peace Camp, even more now than we did 10 years ago when we started." 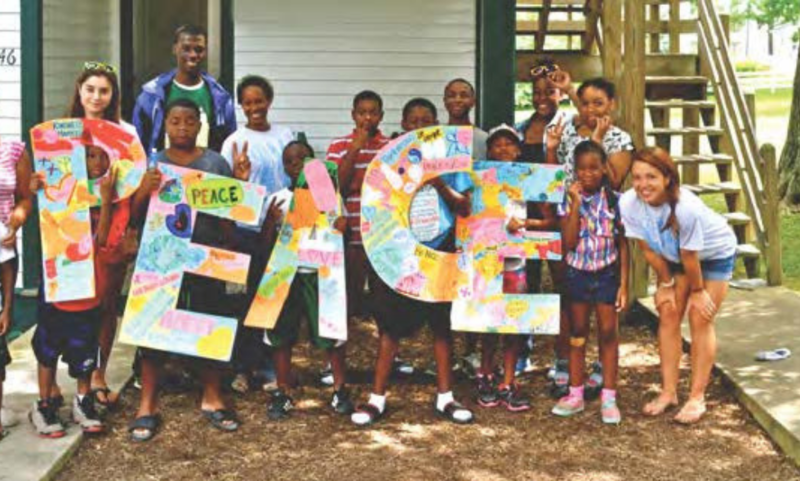 These were the words of Baltimore community organizer and activist, Ralph Moore, as he spoke to parents whose children were enrolled in our tenth annual Peace Camp in 2016. As a Jesuit Volunteer at the St. Frances Academy Community Center in 2006 and 2007, I began learning community organizing under Ralph’s direction. When I started my JV year, Ralph was the director of the Center, working on community outreach, joblessness, and youth programming. When he and I began looking for a summer camp idea during my JVC year, teaching peace seemed to be the most logical idea to both of us. At the time, Baltimore‘s homicide rate was the highest it had been in recent years. Basing our model on existing peace camps, we eventually created a six-week, free summer day camp with meals, a weekly field trip, art and music classes, and two weekly swimming sessions. Each week focuses on a different "peace hero," with a curriculum around respecting ourselves, nature and others, as well as forgiveness and communication. We also stress literacy through daily reading and journaling exercises. The camp has a lot of JVC’s four values woven into it. Staff and the kids build community based on respect, care, and restorative principles. Taking inspiration from restorative justice, we have never removed a child from camp due to behavior. As a result, kids understand their worth and place in our community. Further, we stress internal peace by offering yoga and meditation, teach life skills around anger and interpersonal conflict, and incorporate activism and advocacy into our curriculum. research and future work on the ways youth can positively impact their cities. Ralph Moore, co-founder of Peace Camp, and Nawal’s supervisor when she served as a JV. A Peace Camp attendee poses with a handmade sign. In 2013, Ralph and the staff and I decided to incorporate the camp under a non-profit dedicated to the camp’s original ideals. We have staff that has worked with us almost since the beginning, some starting off as volunteers and returning year after year. We call ourselves By Peaceful Means and are sponsored by Strong City Baltimore. Through By Peaceful Means, I have been able to train social justice-based organizations in conflict transformation techniques that help them to more effectively do their work. Ten years later, we know that, beyond being a place that is safe, uplifting, and enriching, Peace Camp is truly fun. We have always believed that if we meet no other goal, the children should be able to come into our doors and be fully children. This camp has filled my life with incredible joy, and I look forward to the next 10 years and beyond. Nawal Rajeh (Baltimore 2006-07) is a PhD candidate in conflict resolution and hopes to do research and future work on the ways youth can positively impact their cities.